We’ve had an odd day. We were at the farmers markets by 0830, then off to pick up some groceries I’d ordered online and a box of nappies at Costco. After the shops, we went on to the produce place to pick up some chicken feed. We got home, the kids had lunch and then Elena was off to swimming. Anyway, back to my point. We picked up some beautifully fresh ocean perch at the markets this morning, and I really wanted to make battered fish for dinner because it’s such a treat. 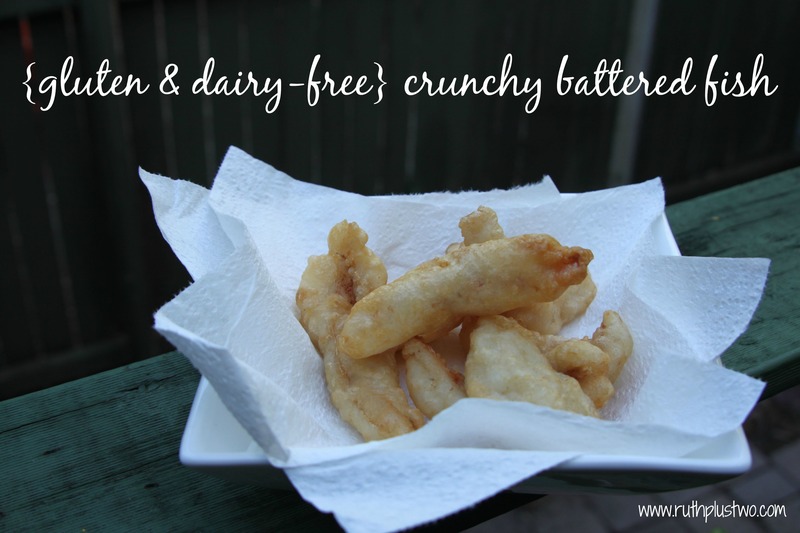 Store-bought battered fish is pretty much a total no-go if you’re coeliac or gluten intolerant. Even if the take-away place has gluten-free batter, their oil would most likely be contaminated too. Pretty much our only option is to make it ourselves. This batter behaves just like normal batter. Use oil suitable for deep-frying (I used canola oil this evening), lightly coat the fish in the batter, and don’t put too much fish in at a time. I once heard that the best way to deep-fry fish was to lay the fillet into the oil skin-side down – but that could be a total old wives’ tale. Who knows. I do it anyway! The end result is crunchy and is just like ‘real’ takeaway fish. Of course, Hugo is also dairy-free, so I’ve used almond milk here. If you have no problems with dairy, by all means just use normal milk. Soy or rice milk would also work if you’re avoiding nuts. Mix dry ingredients well and slowly beat in the milk and soda water until smooth. Dip fish (or chicken, onion rings or anything else you’d like to batter) into the batter and allow excess to drip off. Deep fry until golden and fish is cooked. This entry was posted in dairy-free, gluten-free, recipe, savoury. Bookmark the permalink. Your GF recipes never cease to amaze me. One day you should open up a GF cafe – so many people would thank you. What do they say? Necessity is the mother of invention? I’ve never tried making my own fish & chips before. But after looking at yours, I might give it ago as we seldom buy fish & chips from takeaway places either as they’re not cheap!! By the way, do you fry them using a deep fryer?